With Facebook users sharing 684,478 pieces of content every minute, social is a rather crowded space. Amid all the noise, it can be easy to tune out your audience all together. But when your fans’ concerns are left unaddressed, your brand equity is at serious risk, resulting in disappointment and missed opportunities. Research shows that consumers are increasingly engaging with media and entertainment brands, sending them 9,052 inbound messages on social each quarter. However, this influx of inbound messages doesn’t correlate with the industry’s 6.6% response rate which is the lowest of any industry. Avoid the consequences of ignoring your audience and, set your brand engagement strategies apart from others in the industry. Learn how to build a social following that supports your business objectives by applying the social tactics of media and entertainment brands that are using social to effectively engage. Paper Magazine revised its strategy just over a year ago and implemented a multiplatform approach to content distribution. Instead of focusing all its brand efforts on print, Paper committed itself to publishing relevant, high-quality content wherever its audience was active and present. The publication’s revised strategy has proven to be successful. In an interview with AdExchanger, Drew Elliott, Paper’s Chief Creative Officer, revealed that within 18 months, traffic to the magazine’s website was up by 900% and digital revenue had increased over 400% in comparison to the previous year. To engage its social community, Paper directs its audience to multiple platforms throughout its digital and social ecosystem. The publication informs fans which network it will be on and offers a preview of the content that will be shared there. For instance, this photo of Paper’s upcoming Erykah Badu Snapchat concert coverage was shared on the brand’s Instagram. The publication includes its Snapchat username in its Instagram bio and as its profile picture on Twitter and Facebook. This cross-channel content strategy increases brand awareness and is a seamless and natural way for readers to consume messaging. 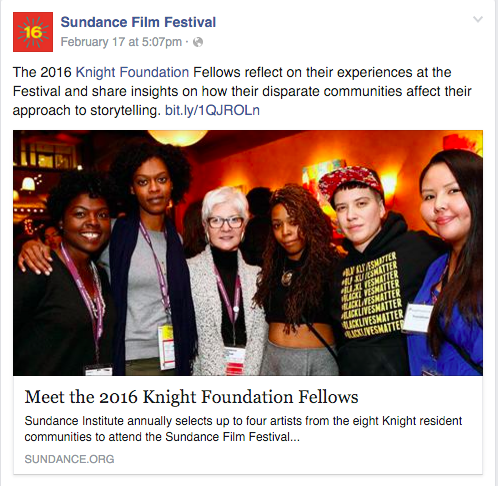 To engage its social communities and increase brand impact, Sundance Film Festival often leverages its ongoing partnerships. The festival amplifies its partnerships through strategic tagging across all social platforms. This increases the festival’s visibility while exposing the brand to new audiences with similar interests. The Carolina Hurricanes use social to provide fans with a holistic game-day experience. The brand does this by varying the content it shares before, during and after hockey games to align with a viewer’s expectations. Player interviews are shared on Facebook. Facts and statistics are broadcasted on Twitter. Vine provides fans with a constant loop of behind-the-scenes footage from practice. Facebook is used to communicate event logistics like parking and other stadium policies. Photos announcing the start of a game are shared on Instagram. Game day activity is shared on Snapchat. The brand also uses the network to interact with fans by responding to Snaps natively and on Twitter. Fan photos from the game are shared on Twitter and Facebook. The brand live-Tweets each game–announcing the score, sharing GIFs of plays, providing commentary and addressing the progress of the game. Interviews and locker room activity are shared on Instagram. Game highlights are shared on Facebook in the form of videos and blog posts. Recaps of games are published on Twitter. The team’s social strategy focuses on the features of each social platform by publishing content where it makes the most sense. This approach engages fans at every brand touchpoint, making it more likely that they will have a positive experience. Since customers who have a positive brand experience spend 140% more than those who have a negative one, there’s a greater potential for the Carolina Hurricanes’ social efforts to correlate into increased sales. Justin Timberlake is a widely popular celebrity who uses social media to engage with fans at scale. The star’s social accounts receive a large amount of inbound messages. Still, Timberlake finds ways to personalize his responses and give fans exclusive access to his life on and offstage. The battle of building an engaged community is achieved not only by interacting with fans one-on-one but also by broadcasting these interactions. On Twitter, he regularly Retweets comments from loyal fans. This encourages other followers (who want their Tweets recognized) to engage. On Instagram, Timberlake shares intimate photos of his daily life with his family, pokes fun at himself and offers unparalleled access to events and performances. These videos and photos make the celebrity more accessible to fans and help increase engagement across his social communities. Effective brand engagement strategies prove that the media and entertainment industry can kick its poor habits and better reach its audience. Stand out from competitors, and apply these social media engagement tactics across your organization’s social channels.